Montfoucault was Pissarro’s refuge, his safe haven. 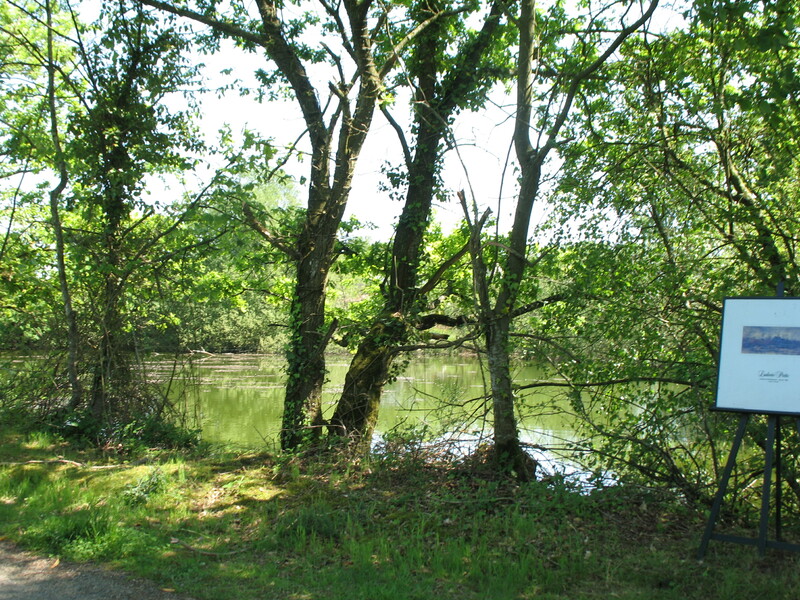 The large country estate in the Mayenne, home of Pissarro’s artist friend Ludovic Piette, was the place where Pissarro could take his family in times of trouble and need. 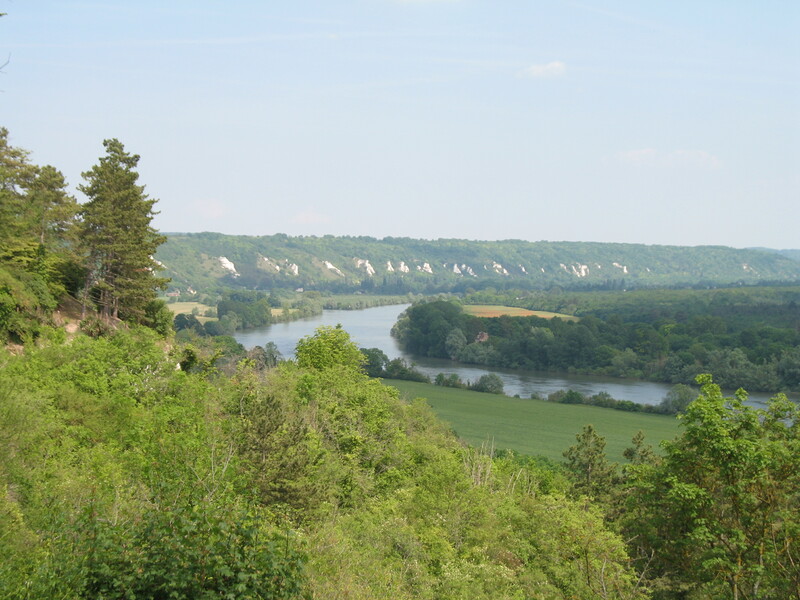 He made five visits there painting the secluded countryside in springtime, fall and winter. 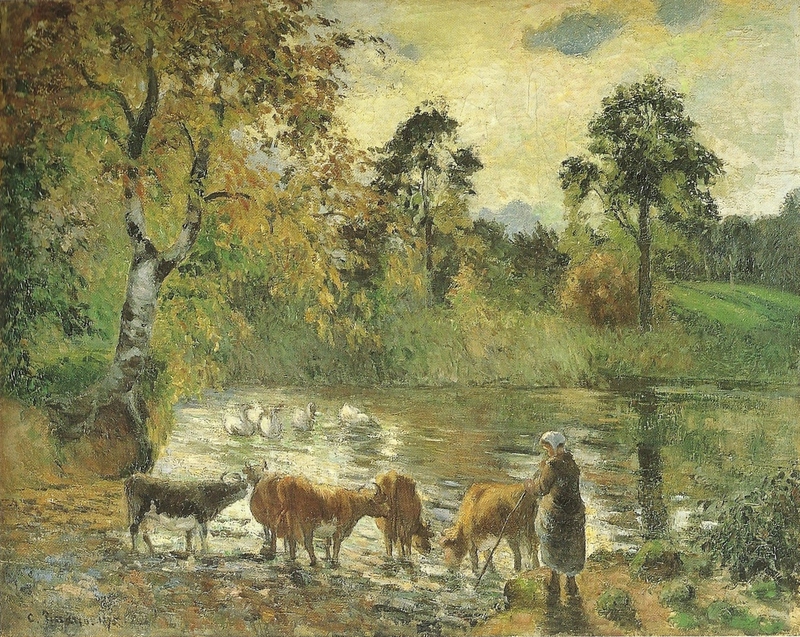 This autumn painting features a small herd of cows drinking at the edge of the pond, tended by a peasant woman. The bucolic scene is framed by the large forked tree on the left and another big tree on the right. We can almost feel the warmth of the autumn sun that reflects on the backs of the three red cows. The space is shared by a flock of geese bathing in the pond’s center. This version was painted on site, but it became the model for another larger painting completed later the same year in Pissarro’s studio. 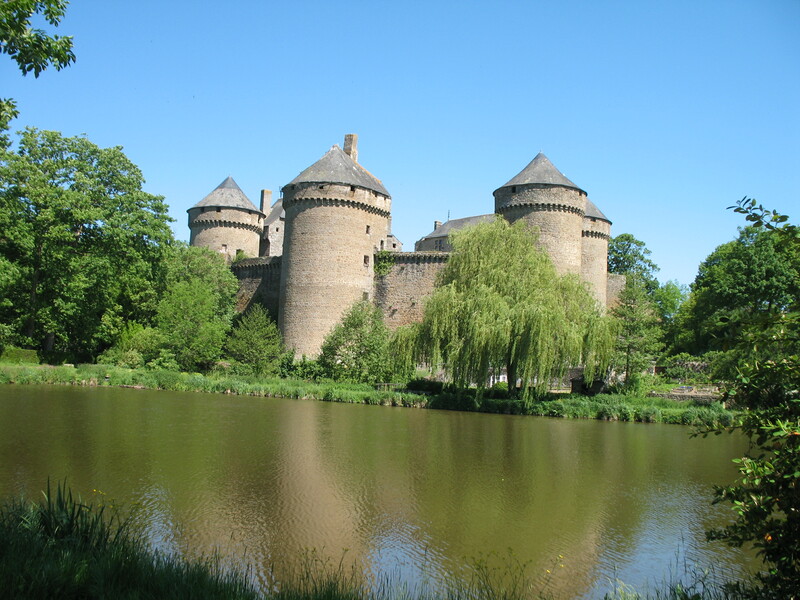 While you are in Lassay les Chateaux, take time to see the largest historic chateau, originally built in the 12th century and rebuilt in the 14th century after destruction during the Hundred Years War. It still has its eight massive towers, ramparts, barbican and a working drawbridge. 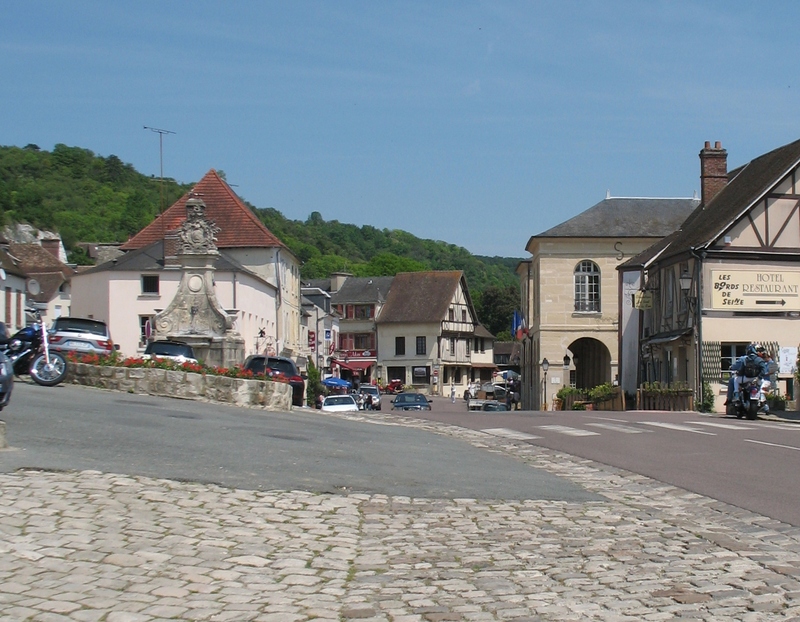 [http://www.lassay.co.uk/] [http://www.tourisme.fr/office-de-tourisme/lassay-les-chateaux.htm] The photos are by Paul Climance, local historian in Lassay-les-Chateaux. 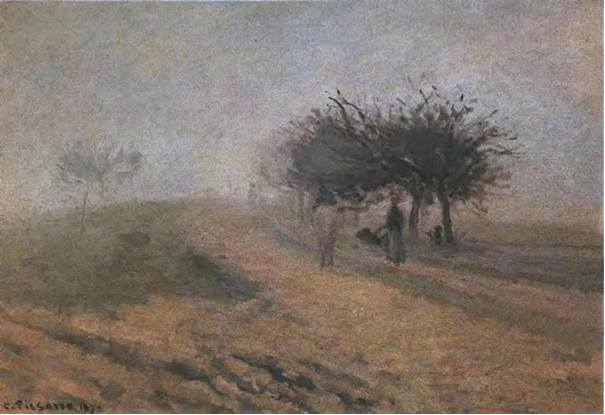 Pissarro used realistic elements to create scenes that now appear almost abstract, as demonstrated by the comparison of Misty Morning at Creil, 1873, with Rothko’s Untitled, 1969. Certainly color field paintings were unimaginable in the vocabulary of the Impressionists, but from the current post-abstract perspective, the similarities in the two paintings are apparent. The simple reading of the Pissarro painting is that of a common landscape, depicting a condition of weather. All of the Impressionists were interested in portraying various types of weather on the canvas, and many of them painted fog or mist in scenes similar to Pissarro’s. However, most of these artists provided some kind of recognizable focal point to draw the eye. In Misty Morning, the eye searches for an important focal point, and settles instead on the complementary contrast of the sky and land, two distinct color fields. 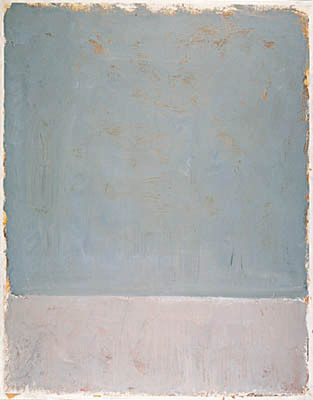 The dusty blue sky with orange-shaded undertones is surprisingly similar to the top of the Rothko, which is also a dusty blue with shades of orange peeking through the brushstrokes. The lower half of the Pissarro is not a solid color field like that of the Rothko, but the overall impression is similar. In the foreground, Pissarro uses the orange-shaded color to depict the muddy ground. Near the crest of the hill, a silvery white frost covers the ground creating an effect similar to that in the lower half of the Rothko. The elements that add realism and set the Pissarro apart from the Rothko are the images on the horizon. Just right of center is a dark blotch that represents several trees along with shadowy figures. In the center left is another shadowy tree image. While a landscape by another artist might use these figures as a focal point, Pissarro makes them dissolve into the background. The trees are dark blue and the covering mist erases any detail of structure that might grab the eye’s attention. Instead, the trees serve as a simple division between the contrasting colors of the sky and ground. The use of human figures tends to draw the eye, but here Pissarro has minimized their importance. The color of the woman’s upper garment blends with the trees while her skirt is the same color as the ground. The man is practically invisible, with a cap the color of the trees and clothing that fades into the background. There may or may not be another shadowy figure farther up the hill. The obvious effort that Pissarro made to blend the people and trees into the background suggests that they are not to be considered focal points. The obvious point of interest is the complementary contrast between the sky and ground, two color fields only slightly more complicated than those depicted in the Rothko painting. One might say that Pissarro just painted the scene as he saw it, and that he did not “intentionally” paint something that today can be compared to Rothko’s color fields. While Pissarro would not have used the same vocabulary, he certainly was striving for different effects throughout his career. To accept the obvious in his paintings is to miss the point of his work. It is only on close scrutiny that his genius is recognized. 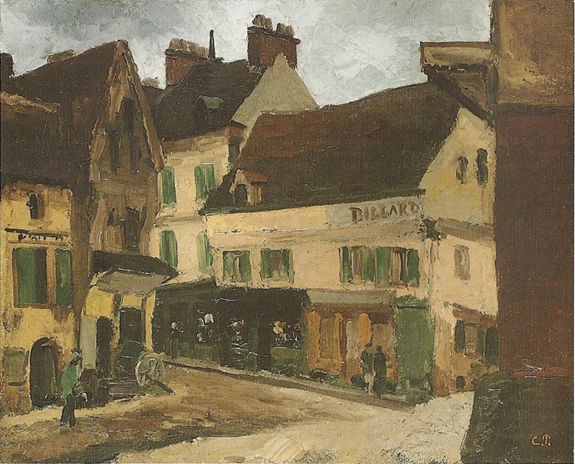 Last weekend, the small half-timbered building on the left had a sign reading, “A Vendre,” “For Sale.” It seems a bit shocking because Pissarro’s iconic painting of this intersection in La Roche-Guyon has become a benchmark in his early works. But Pissarro chose to paint places that were commonplace (or common place) rather than famous landmarks. He effectively captured the spirit of the place, which has changed remarkably little in the last hundred and fifty years. He seems to have rearranged the architecture to meet his own artistic goals, since the gabled roof and half-timbered façade actually appear around the corner. Much of the appeal of this painting lies in the patterns made by the lofty gables and brown rooftops. The center building is the tallest, and its gable is topped by chimney pots. However, the decorative half-timbered façade provides the greatest interest. The people are merely elements giving human scale to the buildings. The thick impasto (layers of paint) over most of the painting suggests that Pissarro used the palette knife. This painting was made just two years after Pissarro and Cezanne became friends. During this period, they were challenging each other to develop innovative artistic techniques, according to Joachim Pissarro, curator of “Pioneering Modern Paintings: Cezanne/Pissarro” (2005 exhibition at Museum of Modern Art). Since La Roche-Guyon has become a tourist destination in recent years, we can only hope the little half-timbered building will be acknowledged as the subject of this important painting.